The TMK-IO contains essentials for an individual operator to administer medical attention. Just add your preferred hemostatic agent (Celox, Hemcon, or QuikClot). 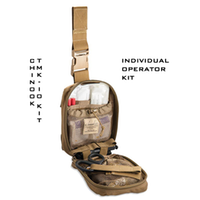 The TMK-IO contains essential medical supplies for an individual operator to administer immediate medical attention based on the three leading causes of preventable death on the battlefield. The Individual Operator features an adjustable and removable thigh mount system with a zippered outer pocket. Internally, there is a three-layered upper pocket system, a two-layered lower pocket system, and an elastic retainer band for tourniquet placement – all designed for easy access while still mounted. Made of 1000 Denier Cordura Nylon and is MOLLE compatible with PALs webbing.